A few weeks ago I came home to alarms blaring and water covering the hallway floor. 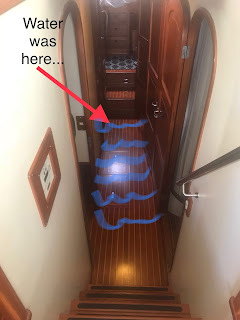 Good news....I discovered our high water alarm works, the high water bilge pump works, as well as my other electric bilge pumps and the BIG whale manual pump (bilge pumps pump water out of the boat - important items to have working). This all happened right after we put Noeta back into the water after getting the bottom painted, I hung out on the boat after I got back to the slip just to watch things to make sure she was OK. After about an hour, I went to the store to get food for dinner. When I got back to the boat, I heard an alarm beeping. When I got into the wheel house, the high water alarm was blaring and flashing and the bilge pumps were cycling. My initial thoughts were along the lines that one of the shaft glands had failed or a thru hull hose failed. If that was the case, salt water would be continuously entering the boat. I quickly went down the stairs and water was in the passageway...holy crap! I went into the engine room and didn’t hear water rushing in. That was good. So I pulled the floor boards up. There wasn't much water in the bilge. Also good. I then proceeded to the forward head (bathroom) which I could now see was where water was running onto the passageway floor. I opened the cabinet under the sink and could hear water running. Now I could also hear the water pump running. The running pump meant that water was being moved out of our fresh water tank through the plumbing system of the boat (and onto our beautiful teak floors). I found a fresh water fitting had worked its way loose and about 150 gallons of fresh water had been pumped out of the forward tank. Of course we had just filled the tank, so the entire thing emptied into the boat. Crisis was over at that point. I turned the pump off and made the repairs to the fitting. Then Jack refilled the tank with fresh water again. Truly this is probably the best and safest way we could have tested all of the pumps, alarms and filters. Around 150 gallons of water in my bilge will set off the high water alarm and activate the big high water bilge pump. My other bilge pump filter needed cleaning - it was clogged and was having a hard time keeping up. The big manual pump moves A LOT of water if you need too. 150 gallons of water will leave you with a very clean floor.